Hello, I’m Rosy Thornton, and to date I’ve written five novels (More Than Love Letters, Hearts and Minds, Crossed Wires, The Tapestry of Love, and Ninepins), the last of which won the East Anglian Book Awards prize for fiction. 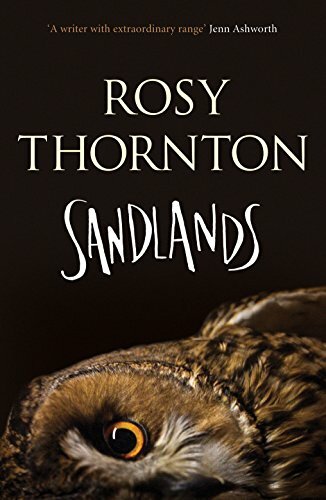 My current book, Sandlands (published on 21st July by Sandstone Press), is my first collection of short stories. The sixteen stories are all set in the same small village in strip of coastal Suffolk known locally as the ‘sandlings’ or ‘sandlands’. As well as a setting and a few shared minor characters, they are linked by their common themes: of the natural world, wildlife and the relationship of people to their landscape, and also how the past can make itself felt in the present in various unexpected ways. Some of the stories are ghostly or magical; some are poignant and sad; one or two are (I hope!) funny. That’s an easy one, with this book in particular. The village where the stories in Sandlands are set is my own village of Blaxhall, where I acquired a home about four years ago now. The place is utterly beautiful and has an amazingly diverse natural habitat, endowed with a rich variety of wildlife, and it is that which inspired my stories. Nine of the sixteen stories take as a central motif a particular species of animal or bird, flower or butterfly. The opening scene of the first story in the book, ‘The White Doe’ – which is also, in fact, the first one I wrote – is of a woman watching from her bedroom window in the early morning as a string of roe deer come up a bank into her garden and through to the lane, and one of the deer is white. That was me: my bedroom window, my garden, ‘my’ white doe. Of course, the character who developed as I wrote the story isn’t me, and what happens to her is all invention – but it began with what was in front of my nose, with the wildlife all around me. Character names, for me, always have to have a reason behind them. At a very basic level and for reasons of authenticity, with Sandlands I made extensive use of a list of old Suffolk surnames. But it’s not just about choosing appropriate names for the time and place in which the story is situated, I also like choosing names which have a meaning connected to the theme or content of the story or the attributes of the particular character. For example, one story (‘Whispers’) is about a man who is in a rather depressed and isolated place in his life, surrounded by self-imposed walls, and who has purchased a derelict Martello tower on the Suffolk coast. I called him Dr Whybrow – a name which means ‘fortress’. Another story (‘High House’) has a central character by the name of Mr Napish, which is my shortened and anglicised version of Ut-Napishtim, a figure from Babylonian legend. I can’t tell you what the legend is about without spoiling the end of the story! I’m not sure I would dignify what I do with the word ‘process’. Most stories begin with one tenaciously preoccupying idea, which gnaws away at me for a few days or weeks, until it solidifies into the shape of a story. Then I have to think where the way in is – where it begins – and that’s often the hardest part. Once I’ve started, it usually then all splurges down onto the page fairly fast. Followed by being put away for a week or so, before being taken out again, re-read and either chucked in the bin or else edited into something resembling a half-way decent story. Is that a ‘process’? Definitely. I remember the Saturday morning trip to the library to change my books being a highlight of the week – the children’s sections had big floor cushions and I can still remember exactly what they smelt of! – and how I couldn’t wait to be alone in my bedroom with my new hoard. I especially liked animal books, the sadder the better. Black Beauty, Sajo and her Beaver People, Tarka the Otter, The Call of the Wild. But I read anything and everything – whatever I could lay my hands on. Not until my forties. Fiction, that is to say, because I had always written: I write academic legal books and articles as part of my day job as a university law lecturer. But although I was a voracious reader (I must have read two or three books a week from my teens onwards) writing fiction is not a thing that it had remotely occurred to me I’d be able to do. We lawyers are famously rather pedantic, narrowly analytical thinkers, not given to flights of imaginative fancy. Then, eleven years ago at the age of 41, I watched the BBC’s adaptation of Elizabeth Gaskell’s novel North and South and was smitten. I’d always loved the book – and now fell under the spell of the very beautiful Richard Armitage who played the mill-owner, John Thornton. So I went online to chat about the adaptation and the book – and found fellow devotees writing North and South fanfiction. I’d never heard of this phenomenon before, but was beguiled, and soon tried my hand at writing my own… and three months later found I had written a full-length pastiche sequel to Gaskell’s novel! It was complete tripe, of course, but by then I was in the swing of the thing, and carried straight on afterwards to write my own first original novel. I have too many to mention. I love the nineteenth century classics – Austen, Eliot and Gaskell in particular – and the period fiction of authors such as Barbara Pym, Elizabeth Taylor, Elizabeth Bowen and Penelope Fitzgerald. But I also love many contemporary writers: Hilary Mantel, Ali Smith, Kate Atkinson, Sarah Waters, Deborah Moggach, Esther Freud, Andrea Levy, Helen Dunmore, Jane Smiley, Lorrie Moore, Barbara Trapido… The common factor is probably that they tend to be women. Given my reasons for starting out in fiction-writing, it would have to be Elizabeth Gaskell really, wouldn’t it? And I could ask her what she thinks would have happened next, after Margaret and John get together at the end of North and South. What intrigues me especially – and the thing I most wanted to explore in my fanfiction – is what on earth Mrs Thornton senior would have to say about the matter. What are you working on right now, and when can we look forward to a new release? I have an idea for a new novel, but so far that’s all it is: an idea. A setting, a rough shape, a few hazy, half-formed characters, but no actual words yet on the page. I’m sure it will emerge in due course… but it may take some time. Sorry! Next Article July wrap up….. Thank you so much, Kerry, for having me along to your blog! ‘any resemblance to actual persons, living or dead, is entirely coincidental’ – and there is no such town as Manchester… I have no idea which verso page this came from but it is my favourite!